Kristian Levring's western, starring Mads Mikkelsen as a Danish settler in 1870s America, is a childhood dream come true. 1870s, America. When settler Jon kills his family’s murderer, he unleashes the fury of the notorious gang leader Delarue. Betrayed by his corrupt and cowardly community, the peaceful pioneer must turn vengeful hunter, slay the outlaws, and cleanse the town’s black heart. Alongside a very successful career directing commercials, Kristian Levring was among the co-founders of Dogme 95. His contribution to the movement, the English-language desert drama The King Is Alive (2000), was selected for Un Certain Regard in Cannes. The Salvation is produced by Sisse Graum Jørgensen for Zentropa. Kristian Levring has always loved Westerns. Making The Salvation, with Mads Mikkelsen as a Danish settler in 1870s America, was a childhood dream come true, says the director, whose Dogme days still mean a lot to him. Kristian Levring, a 57-year-old film industry veteran, lights up with child-like glee when he talks about his love of Westerns. As a boy growing up in Denmark, he watched classic Westerns on TV on Saturday afternoons. And now he’s made his own, The Salvation. For anyone expecting a Dogme Western, look elsewhere. 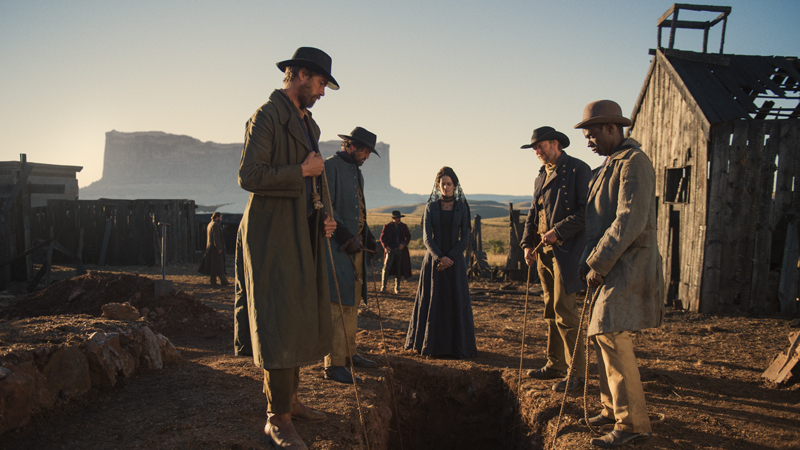 The Salvation is pure genre, reveling in films of bygone eras while having a colourful modern punch as well. “To do an arthouse Western wouldn’t make any sense. I wanted so much to do a genre film, a classic Western,” Levring explains. Levring “had an old idea in a drawer” for the bare bones of the story so he called screenwriting collaborator Anders Thomas Jensen, who like producer Sisse Graum Jørgensen had worked with Levring on 2008’s Fear Me Not. 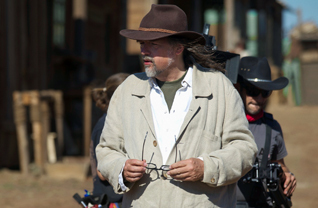 Jensen, whose credits include Oscar winner In A Better World, was very keen on the idea of trying a Western. What they came up with was the tale of a Danish settler in 1870s America, who sets out to avenge his family’s murder and confront the gang leader in a corrupt community. The Salvation feels very much a film that celebrates past Westerns on screen, rather than just presenting the reality of the Wild West. “I made a Western that’s a myth about Westerns,” says Levring, although he adds that he did a lot of research for authenticity. Levring’s background as an award-winning commercials director for two decades – for huge clients such as Mercedes, BMW and Carlsberg – came in handy with some of the big choreographed scenes such as the shootout. “I never had the opportunity to play with those ‘tools’ making a movie before,” he says. Levring’s first choice to play the Danish settler, Jon, was the much-in-demand Mads Mikkelsen. “He’s made for the Western. He’s a very physical man, and there is the sparseness of his craft.” Fellow Scandinavian Mikael Persbrandt plays his brother. Eva Green has a challenging role playing a scar-faced woman rendered mute after her tongue has been cut out. “She had that strength,” Levring says. “It was hard to play someone who can’t speak at all.” And, in a surprising turn, footballer-turned-actor Eric Cantona plays one of Delarue’s sidekicks. “I’m a Man U [Manchester United] fan, and I never imagined he’d say yes,” Levring says with a grin. The other stars were equine. “I’ve filmed a lot with animals, but the horses are quite tough to work with. They don’t go where you tell them to,” he says with a laugh. “It sounds very banal, but this film was made with a lot of enjoyment,” Levring says, sounding almost guilty for having such fun on a film production. Yet of course there were challenges too. Working on an £8 million budget for a film of this scale was tight. The team immediately ruled out shooting in America because of the expense involved. Instead they shot the entire film for eight weeks on location in South Africa, on a huge farm about 70 kilometers north of Johannesburg where they could build all their own sets. They built about 18 houses and buildings to comprise the towns of the film – augmented with another 40 or 50 houses added digitally in post-production. All houses were built for the purpose of shooting both interiors and exteriors, not just frontages. Being able to inhabit a “real” space “brings a lot to the actors,” the director explains. Levring had shot in Africa before, on commercials shoots in South Africa and also in neighbouring Namibia for his 2000 Dogme film The King Is Alive. Working with his usual DOP Jens Schlosser Levring enjoys the process of sitting down to talk about approaching each of his films with the right technical expertise. “We talk about techniques and equipment and what cameras are available. I’m into technology, to me filmmaking is a technical discipline.” For The Salvation, they shot on the ARRI Alexa. During post-production, some 900 shots were manipulated, “by far” the most he’s done on any film. “We had to create this world of America that looks real,” Levring adds. They shot footage in real places like Utah and Montana to add into the landscapes. Also, South African trees were removed in post. Before the shoot, because of the scale of the project and its budget, his team created computer-generated storyboards for the entire film. “It meant I knew exactly how much I could build and how much time we had for scenes.” He also did more traditional work pre-shoot, making palettes for the film, with oil paints and crayons, which predicted the vibrant primary colours on screen. “I wanted to do a colourful film,” he says. Plus Levring loves the Technicolor look of movies from the 1950s like The Searchers and She Wore A Yellow Ribbon. Danish-born Levring has lived abroad for 20 years, the first four years in Paris and then in London in the 16 years since. “I think I’m a big city person. I love London. I feel at home here. But I also feel very close to Denmark. I am a Dane living in London,” he says. He spends summers and Christmases in Denmark. As for The Salvation, which some might call the first serious Danish Western, it shows a director certainly trying something different than what we expect from modern Danish films. As well as bringing that childhood dream to life, The Salvation brings together slices of his past work – the frontier spirit and desperation in The King Is Alive and The Intended or the thriller intensity of 2008’s Fear Me Not. The Salvation, premiering as a Midnight Screening Out of Competition at Cannes, is produced by Sisse Graum Jørgensen for Zentropa. Director Kristian Levring, born 1957, graduated in editing from the National Film School of Denmark in 1988. Alongside his features, Levring has a successful career as a commercials director based in London. Levring was among the co-founders of Dogme 95, contributing with The King Is Alive (2000) starring Jennifer Jason Leigh, Janet McTeer and Romane Bohringer. The film was selected for Un Certain Regard at Cannes. Levring’s UK production The Intended (2002) played at the Toronto Film Festival, as did Fear Me Not (2008). 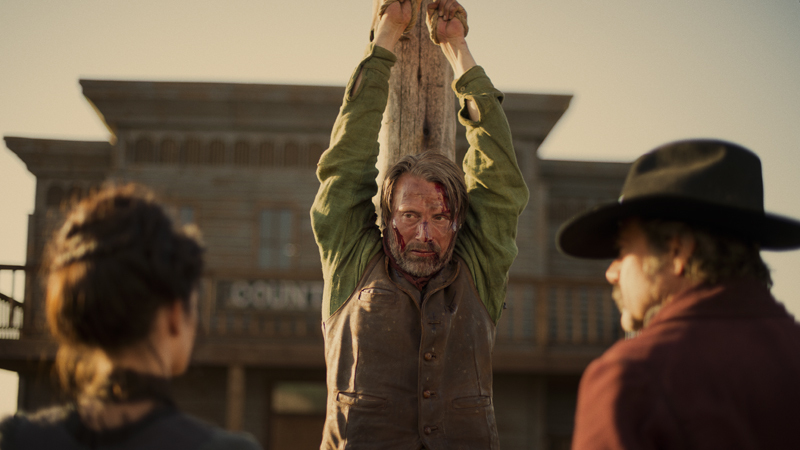 He is made for the Western, Levring says about Mads Mikkelsen. The much-in-demand actor plays the peace-loving Danish settler who turns vengeful hunter when his wife and son are brutally murdered. There are about 68 different filmic references to past films in The Salvation, according to the director. But he doesn’t want to point out specific examples. It’s more fun for people to discover them, he says. The director and his team shot The Salvation in South Africa on a huge farm north of Johannesburg. DOP Jens Schlosser has been working with Levring since their Dogme film The King Is Alive, filmed in neighbouring Namibia.